Combining preclinical in vivo imaging modalities offers the opportunity to synergize the strengths of each in one experiment. For example, optical imaging offers the ability to non-invasively and longitudinally track molecular and cellular events, frequently using bioluminescence or fluorescence genetic reporters. But this can be further enhanced when combined with dedicated high performance micro-CT, to provide high resolution anatomical data. In this webinar, Dr. Kah-Wye Peng, Chief Operating Officer at Imanis Life Sciences, will outline the range of products and genetic reporters systems and reagents offered by the company for use in optical and nuclear imaging. Imanis provide reporter gene cell lines, lentiviruses, oncolytic viruses, antibodies, lentiviral plasmids and custom products to support non-invasive reporter gene imaging and oncolytic virology research. 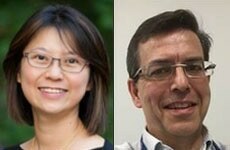 Dr. Peng will be joined on the webinar by co-presenter Dr. Andrew Van Praagh, Field Applications Scientist, from Bruker BioSpin, who will describe some of the research facilitated by bringing together the products and reagents offered by Imanis with the state-of-the-art multimodal imaging technology delivered by Bruker. During this webinar, Peng will outline the various products her company have been making available to researchers since founding in 2012. This includes facilitating imaging with fluorescence, bioluminescence and radioisotopes. She will highlight the benefits of multimodal imaging, including early detection, high sensitivity and accelerated drug development. The webinar will also illustrate how the products offered by Imanis Life Sciences perfectly complement Bruker’s technology. Dr. Van Praagh will demonstrate some specific examples of preclinical research drawing together the technology from both companies. He will also highlight how the Bruker In Vivo Xtreme II imaging system combines four imaging modalities – luminescence, fluorescence, radioisotope imaging and X-ray – in one to deliver an unparalleled level of sensitivity, speed and versatility in preclinical imaging. Further, the relative strengths for Optical, microCT, and MRI imaging in tumor progression studies will be reviewed. This webinar will interest oncologists and cancer researchers as well as people working in imaging and the virus gene therapy market. It is also highly relevant for people working in drug development, particularly in the areas of oncology and infectious diseases.